Hiya guys! Would you look at that, after one day and I already failed my 'nail art every day' challenge. The sad thing is that I had the manis and everything all ready to publish. But thanks to a migraine I was laying in bed, in the dark, for 24 hours. *Sigh* I will be making up those two manis by double posting during the next few days. Double the manis for double the trouble, haha. 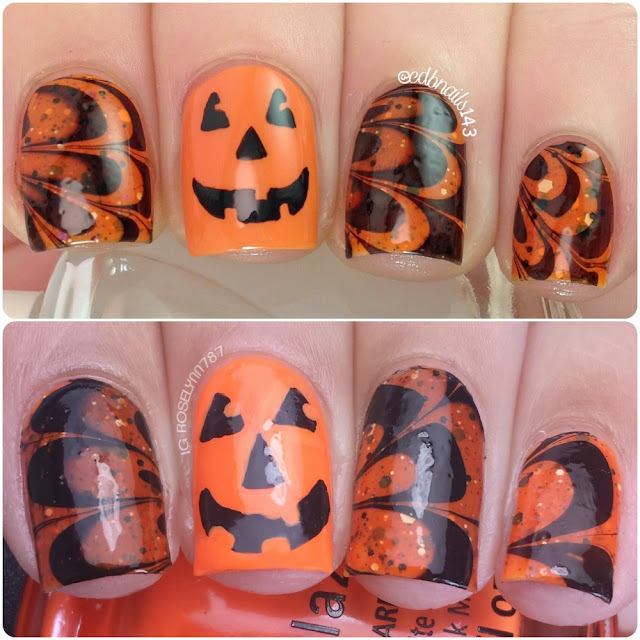 For today I am sharing a pumpkin watermarble, which also happens to be bestie twin nails with my girl Cheyenne from CDBNails. I really love how this turned out! Not only is this my first time attempting a pumpkin face, but also my first clear watermarble. Yay for knocking out some firsts! Since Cheyenne is the maker behind CDB Lacquer we decided on a polish we both owned and that's the base Spooktacular. For the watermarble I used the clear polish Clearwater from Pipedream Polish and my new black from China Glaze Liquid Leather. 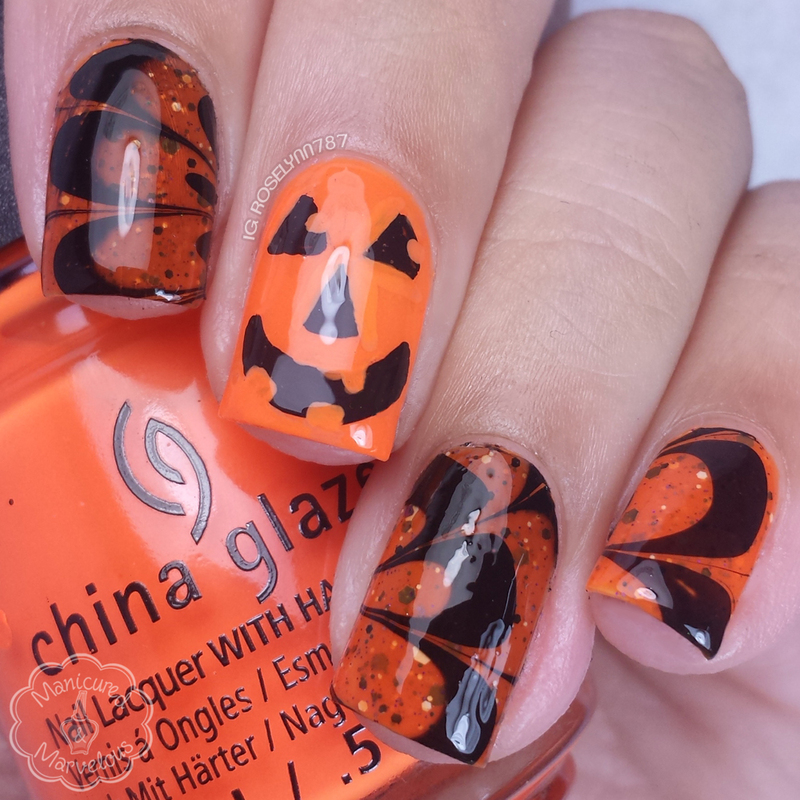 The accent nail base is called Lady and the Vamp also from China Glaze and the face was drawn with black acrylic paint. Definitely proud of us both! This is the best watermarble we have done to date and not to mention the closest we have ever done our art! I wish I could of recorded the process, but I have a had enough time with videos and watermarbles that the combination of the two might have made me explode! Maybe one day though, I can only dream haha. Definitely share with me any video recording tips you may have guys! I'm so proud of our marble! Haha hopefully we just keep getting better! They both turned out amazing! How cool! I really like Spooktacular too! These are so fun!! I love when you guys do these posts! Both of these are fantastic! Awesome job ladies! They are so closed that they are twins for real! Love both of them! You guys did a great job with these.! these are just adorable. You both are so talented! You guys both did such an amazing job! Very cute! Yay for tackling the water marble demon!!! LOVE!!! 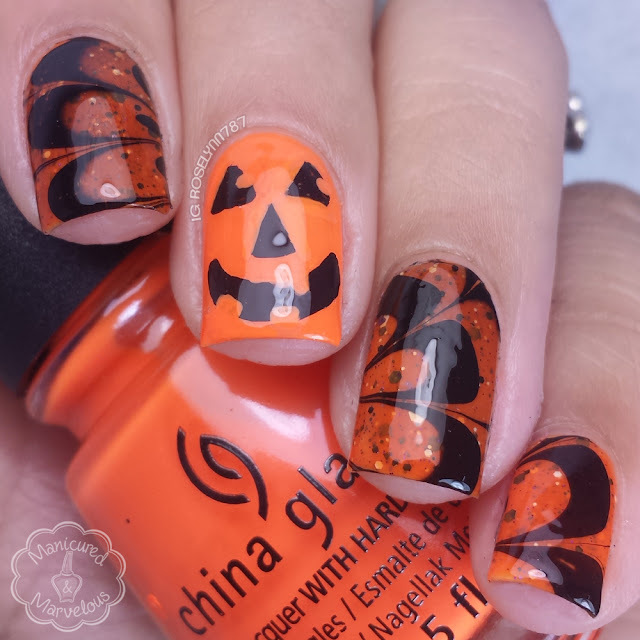 Such a cute pumpkin and that watermarble is fabulous. Love it! Spooktacular reminds me a pumpkin soup wit cinnamon and such (yup, I'on a diet).